It’s not quite drinking with the devil, as the old rock and roll tune has it, but it’s close. Yesterday, Morell & Co. Fine Wine Auctions sold through every one of the lots that were up for sale in an auction of the wine and booze of Beelzebub himself, Bernie Madoff. “All 59 lots, ranging from fine Bordeaux to the types of small bottles often found in hotel minibars, found buyers, with 54 selling above the highest estimated pre-auction price,” reported The Daily Mail today. “The winning bids exceeded the roughly $15,000 to $21,000 the auction...had been expected to raise.” Proceeds from it will go to the victims of Madoff’s massive Ponzi scheme. The moral of the story? Billions of dollars don’t necessarily make you a great wine collector, just a rich one. 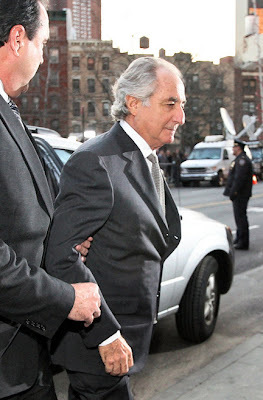 And, in the case of Madoff, a jailed one. I’ll toast to that...with a mini-bottle of booze from his now-sold collection.